It can be tough to sift through the multitude of marketing claims that we as consumers are often inundated with on a daily basis. It comes at you fast, it comes at you often, and it comes at you from a variety of mediums, including print advertising, radio commercials, online advertisements, and so on. HVAC companies and air filtration providers, among businesses from a wide range of industries, are often complicit in making claims that, to be candid, are next to impossible to keep. It can be difficult to parse through the sea of claims and promises when shopping for air filters in the same way it’s difficult to determine fact from fiction when it comes to nutrition or vitamin supplements. But we here at ElectricMasters, being the providers of HVAC service that we are, are not concerned with what individual air filtration manufacturers are saying about their products. Instead of focusing on the negative, we thought we’d take the opportunity in today’s blog to educate our readers on air filters and your health. Because air filtration often gets the short end of the stick when it comes to commercial or residential HVAC systems, we want our readers to understand the importance of air filters as it relates to their health. On top of that, we want you to be able to have a working knowledge of air filtration so you can judge what kind of filter suits your needs best. 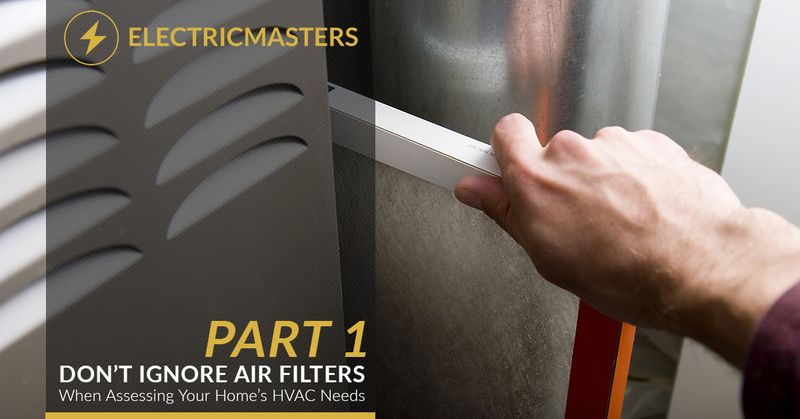 At the end of the day, we want you to be well-equipped when it comes to all things HVAC here at ElectricMasters, so keep reading if you’d like some practical knowledge regarding air filters and your health! Source Control – Source control comes in many forms, from second-hand smoke to mold, radon, or dust mites. When it comes to pest-induced source control problems, keeping a less humid home is a potential solution, as pests like cockroaches, dust mites, or other issues such as mold and mildew tend to thrive in damp settings. Eliminate pest issues with non-chemical methods when possible. Ventilation – Even if you don’t have any glaring source control issues, if your air circulation is poor, you might suffer as a result. Luckily, this is a problem that is usually quite simple to solve: open up some windows and get some airflow going! Air Purifiers – If you are covered in terms of source control and ventilation, you still have an additional step to take in order to ensure an ideal living situation. As you can probably guess, it’s all about air filters. Air filters are evaluated on their ability to eliminate airborne pollutants in addition to the amount of air that can pass through the filter itself. In other words, you want to find a filter that is effective in capturing pollutants while still allowing air to flow freely. In part two of this two-part series, we’ll take a look at what kind of filter you should consider getting based on particular health needs, including asthma and allergies. In the meantime, don’t hesitate to reach out to us at ElectricMasters for HVAC repair, maintenance, or a full-on replacement! We’d love to hear from you.